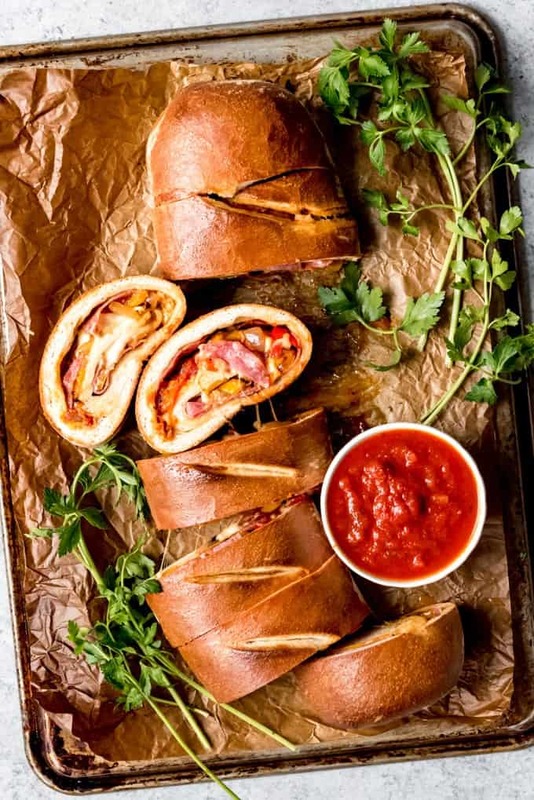 If you’ve ever wondered how to make stromboli like they do at your favorite old-school pizza parlor, this Easy Stromboli Recipe is for you! 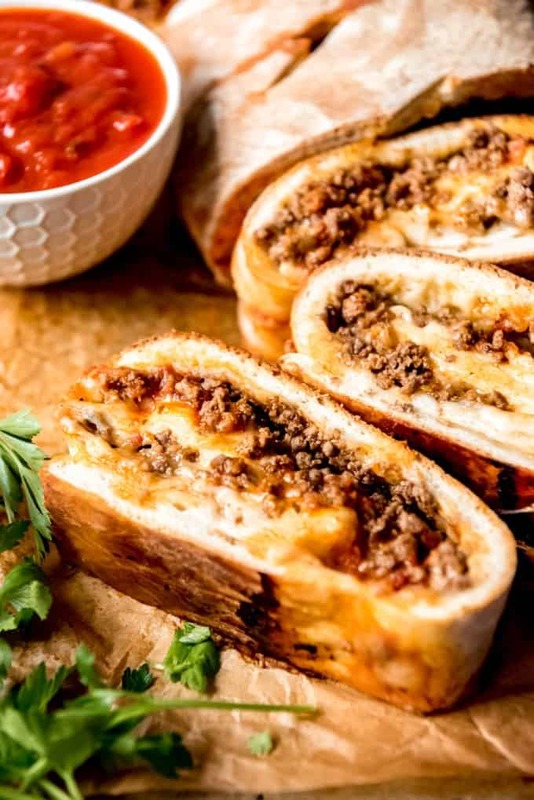 It’s like a rolled up pizza filled with your favorite toppings and plenty of gooey cheese, then baked so that the crust is on the outside. When I was researching foods the state of Delaware is known for as part of my American Eats series, I kept coming across the Nic-o-boli from Nicola Pizza in Rehoboth Beach, a popular seaside destination in Delaware. But figuring out what a Nic-o-boli is, exactly, was a little confusing for someone like me who has never been there and experienced it. From what I can tell, Nicola’s Nic-o-boli is a cross between a calzone and a stromboli. And it has a huge cult following. Like the kind of following that inspired Former President George H.W. Bush to have actual authentic Nic-o-bolis shipped to the White House and other famous personalities to rave about them. 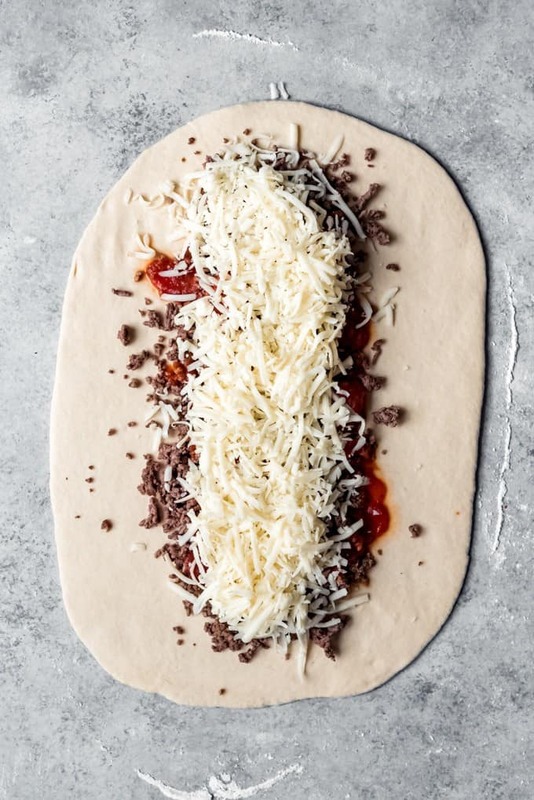 Although you can get all sorts of fillings, the classic Nic-o-boli seems to be filled with ground beef, cheese, and a tomato sauce. So I thought it I would share my best stromboli recipe with you to represent Delaware since I think it’s probably fairly similar, even if it’s not totally just like a Nic-o-boli. 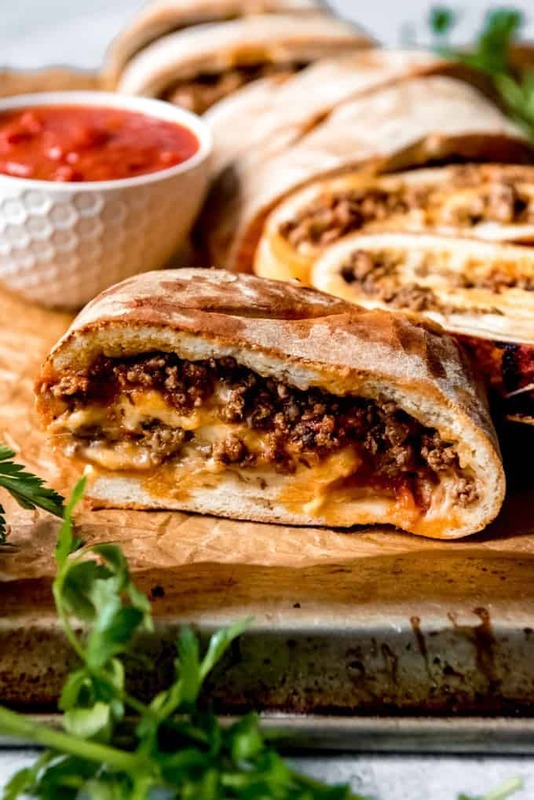 For anyone who has never heard of or had stromboli before, it’s similar to a calzone, which is like a folded up, crescent shaped pizza pouch (the original pizza pocket!). 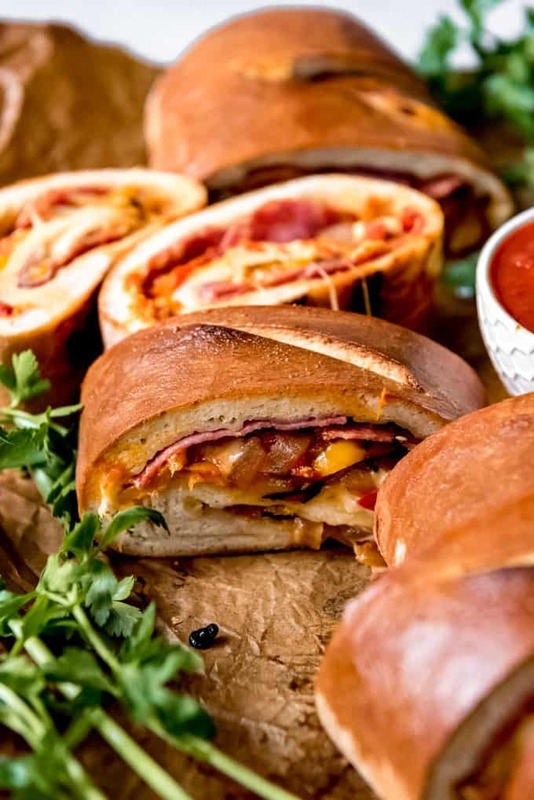 But instead of folding and sealing the edges, a stromboli is rolled up on itself a little like cinnamon rolls (but only kinda sorta) into a cylinder. Except you bake it as a log so that all the cheese and toppings stay in the middle. It’s sooooo good (because PIZZA!!) and you can fill it however you like with any of the toppings you might normally put on a pizza. 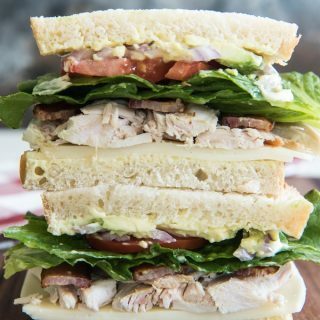 But it’s also sort of like a giant hot sandwich, depending on how you fill it. Wikipedia says that stromboli probably got it’s name either from the volcanic island of Stromboli, just off the north coast of Sicily or from the movie about the island (whose active volcano supposedly inspired J.R. Tolkien when creating the fictional Mount Doom of Mordor in “The Lord of the Rings”) that starred Ingrid Bergman in the 1950. Someday you will be watching Jeopardy and I’ve just given you the answer to the Daily Double with that tidbit of trivia. Just you wait. Also, you’re welcome. Stromboli is a delicious dinner with a good salad on the side like this spinach, bacon, and egg salad with creamy honey mustard dressing, but can also be served as an appetizer, especially at game day parties, and dipped in extra marinara or ranch. I’ll admit it – I like to dip my pizza in ranch. I don’t do it very often because it feels crazy decadent, and also maybe too little kid-ish, but I really do like ranch with pizza. Or stromboli with ranch. I mean, c’mon, who doesn’t want to dip everything in ranch? Roasted broccoli is another delicious side dish we like to serve with stromboli. 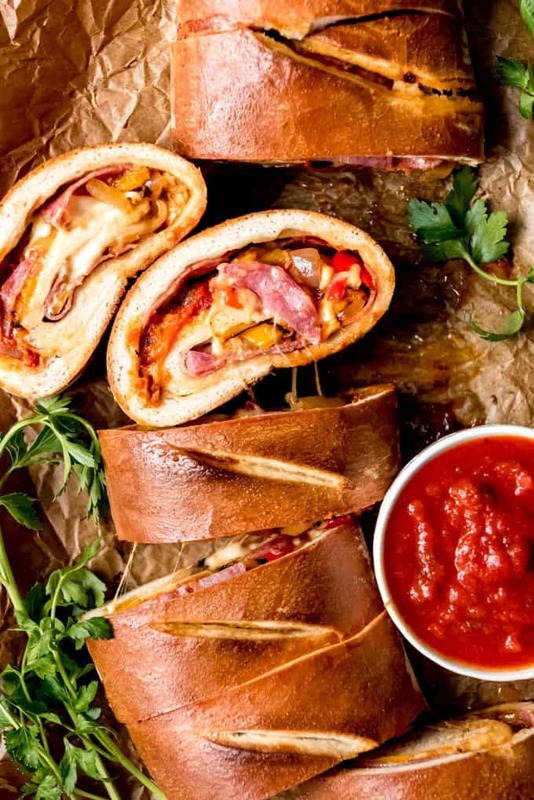 What other ideas or combinations do you like for stromboli? I would love to know in the comments at the end of this post! When distinguishing between stromboli vs. calzone, the best distinctions I have found are in terms of shape and fillings. Although even then, it sounds like there is no clear-cut quality that sets one apart from the other. The first difference though is shape. While calzone are more half-circle or crescent shaped, stromboli are just long cylinders or tubes of meat and cheese filled dough. The second (possible) difference though is filling and flavor. Stromboli is most frequently filled with Italian cold cuts (think salami, prosciutto, soppresseta and such) and cheese but no sauce. Calzone, on the other hand, has basically anything a pizza might have, including sauce. 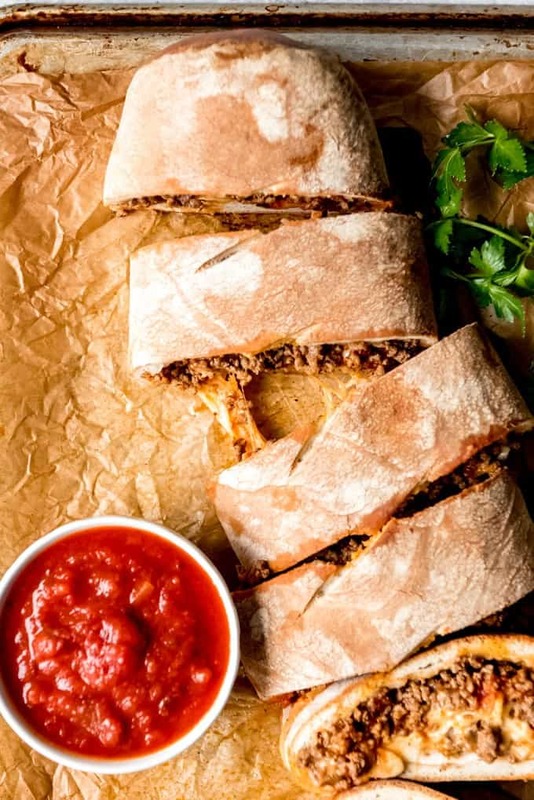 But even then, there don’t seem to be hard and fast rules about what and what not goes into one or the other, so if you want to go ahead and fill your stromboli with sauce, you go for it. It’s what I do too with this stromboli recipe. 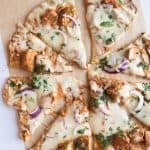 Make your favorite pizza crust. 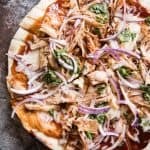 I’ve included a single-batch version of my pizza crust recipe below, but any pizza crust (even the kind you buy at the store in the refrigerated section) would work. 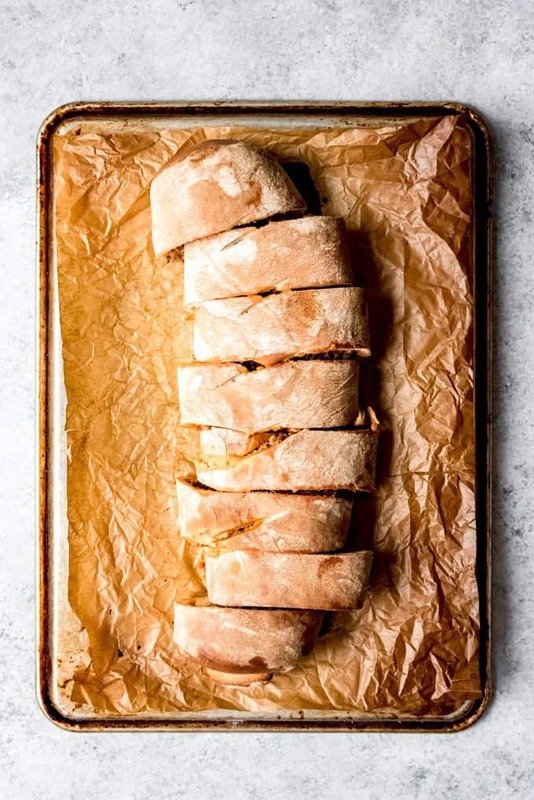 You can easily double the pizza crust recipe and make multiple stromboli so that there are leftovers since my family of 4 can easily tackle one stromboli for dinner on our own. Prepare your filling. 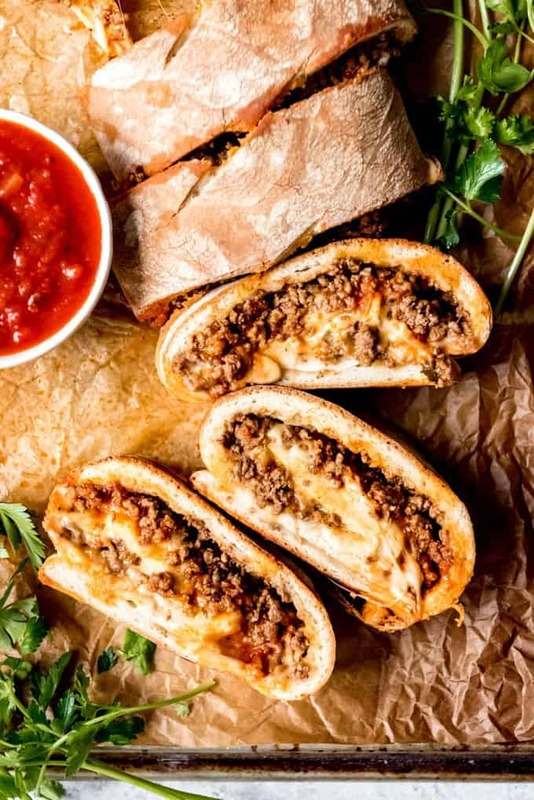 For the super simple, but surprisingly delicious ground beef and cheese stromboli that I think might be sort of similar to the original Nic-o-boli, just brown some ground beef and grate some mozzarella cheese. Or saute some sliced sweet peppers and onions in a little oil in a pan until soft. Roll the crust out into a large rectangle just like you would when making cinnamon rolls. Add fillings like meat, vegetables, cheese, and sauce (or skip the sauce, particularly if you plan to serve it on the side for dipping). Leave a border around the edges of the pizza dough to brush with egg wash. This will help seal the stromboli when you are rolling it up so that the insides don’t leak out while the stromboli is baking. Fold the short ends over first so that the filling doesn’t spill out as the stromboli cooks. 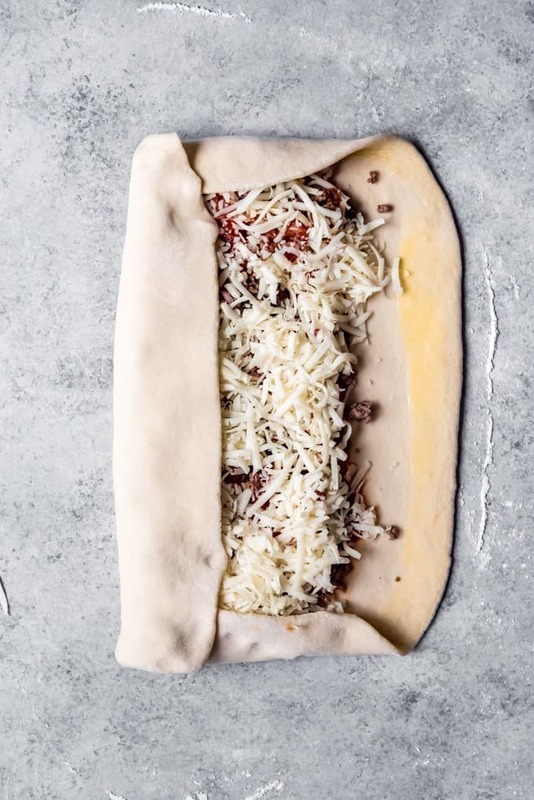 Then roll/fold the stromboli up and place it seam side down on an overturned baking sheet covered in parchment paper and slash the top a few times with a sharp knife to vent steam as the stromboli cooks. I turn the baking sheet upside down because it helps cook pizzas better in home ovens if you don’t have a pizza stone. It’s totally optional to brush the top of the stromboli with egg wash. 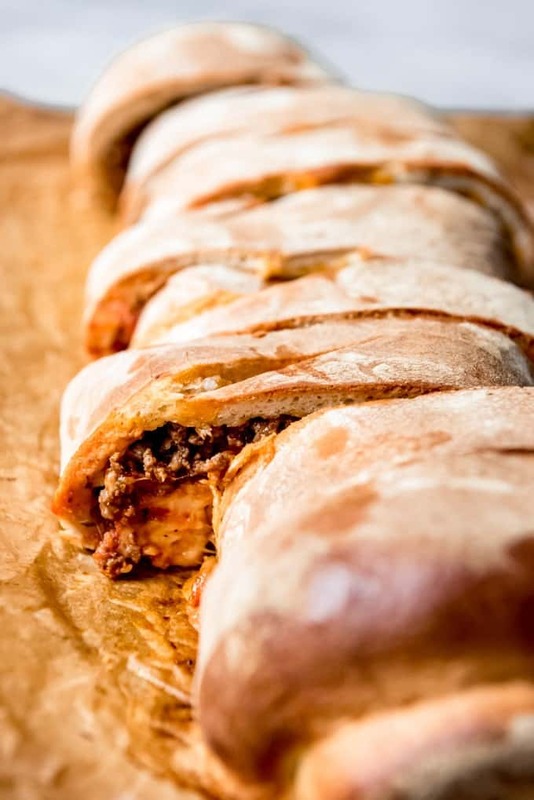 It gives the finished stromboli a beautiful, glossy brown finish. But I actually prefer no egg wash. It has that drier, slightly rougher, flour-dusted texture and flavor that I associate with pizza parlors. 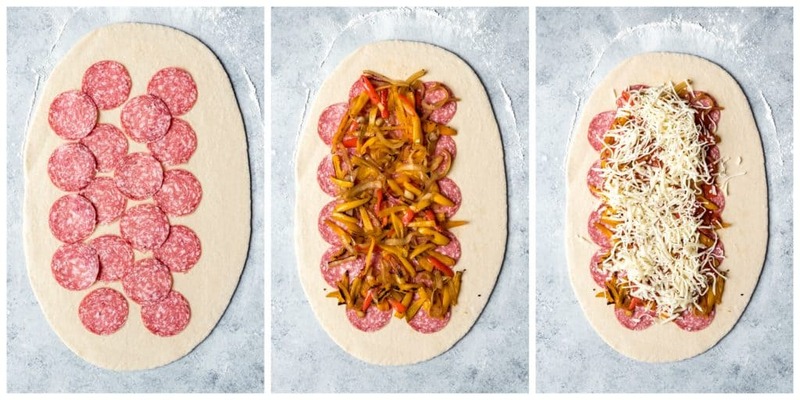 You can see the difference between the ground beef stromboli pictures (no egg wash) and the sweet peppers and sausage stromboli pictures (with egg wash). 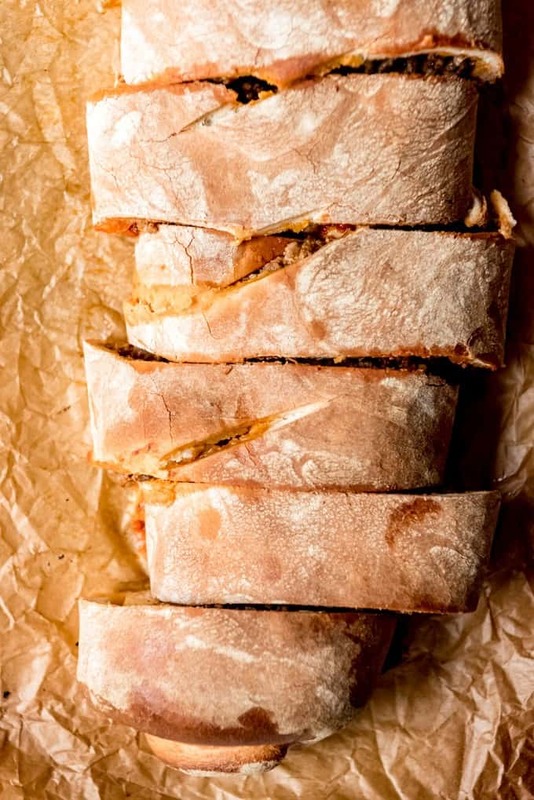 Another option for finishing your stromboli is to sprinkle it with Parmesan cheese and some Italian herbs like dried basil and oregano before baking. If you opt to use a tomato sauce, you can make marinara sauce from scratch or buy it in a bottle from the store. I typically pick up Classico or Bertolli marinara to have on hand for crazy nights or when I’m just feeling lazy. But you might want to cook it down a bit over medium low heat until it thickens slightly so it isn’t too watery when you put it in the stromboli. Preheat your oven for a good 20 minutes or more before putting your stromboli in to cook. 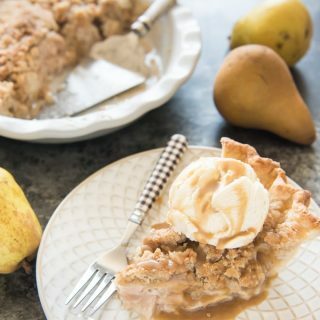 Even though ovens say they are preheated, it actually takes longer than most ovens account for in order to fully heat. 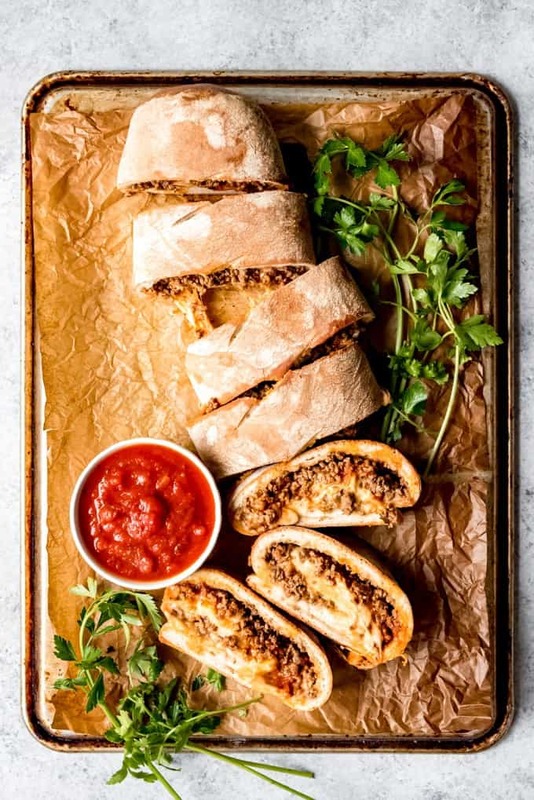 If you've ever wondered how to make stromboli like they do at your favorite old-school pizza parlor, this Easy Stromboli Recipe is for you! 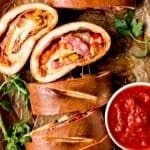 It's like a rolled up pizza filled with your favorite toppings and plenty of gooey cheese, then baked so that the crust is on the outside. In the bowl of a stand mixer fitted with a dough hook attachment, combine the warm water, sugar, and yeast and let sit for 5 minutes. After the yeast has proofed for 5 minutes and is foamy, add the salt and 1 cup of flour and mix well. Continue to add the remaining flour, kneading until smooth for about 5 minutes. Use the olive oil to lightly grease a clean bowl and transfer the dough to the bowl, giving it a quick turn to coat in the oil. Cover with plastic wrap and let rest for 30 minutes. Preheat oven to 400 degrees F for at least 20 minutes. 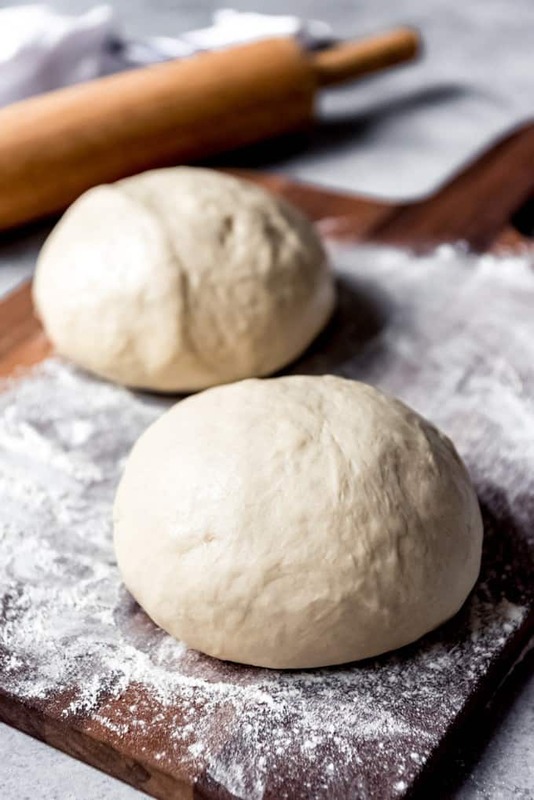 While the oven preheats, roll the dough into a large, thin rectangle. 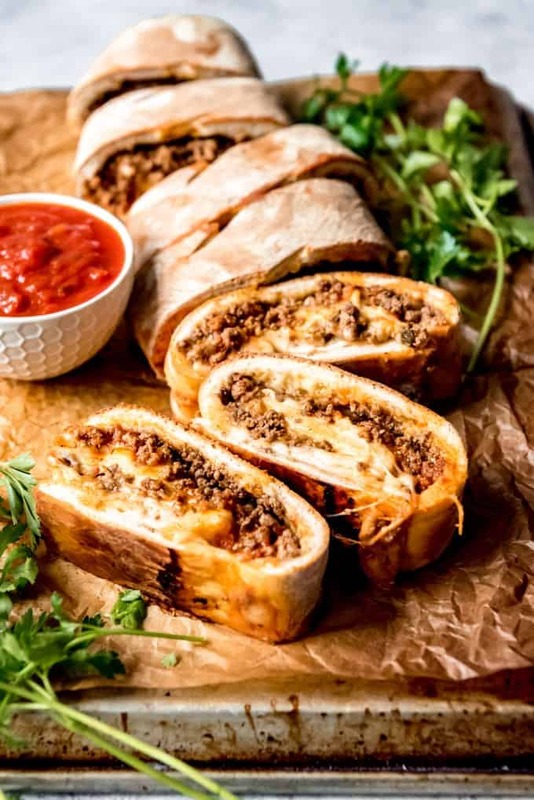 Top with the ground beef, marinara sauce, and mozzarella cheese, leaving a 2-inch border around the sides. 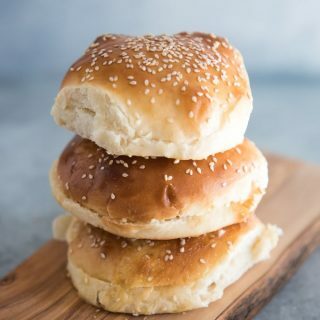 Brush the border with the egg wash, then fold the short ends over the edges of the filling and roll the stromboli into a cylinder shaped log. 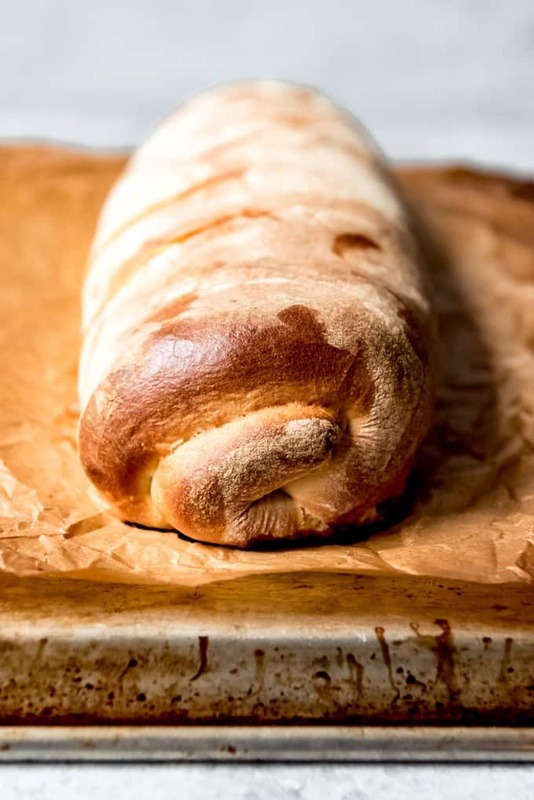 Transfer the stromboli to an overturned baking sheet lined with parchment paper with the seam side down. Brush the top with remaining egg wash (if desired) and cut diagonal gashes across the top with a sharp knife. Bake in the preheated oven for 25-30 minutes until browned on top and cooked through. Let rest for 10 minutes before slicing. 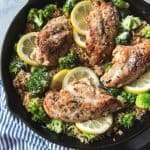 Serve with marinara sauce or ranch dressing on the side. As written, the recipe makes 1 stromboli that is enough for 4 people as a meal or 8 people as an appetizer. But the recipe easily doubles to make 2 stromboli at a time. For the sweet pepper and salami stromboli, heat 1 tablespoon of olive oil in a pan and saute 1/2 sliced onion and about 1 1/2 cups of sliced sweet peppers until soft. Use to fill the stromboli along with sliced salami and 1 1/2 cups of mozzarella cheese.